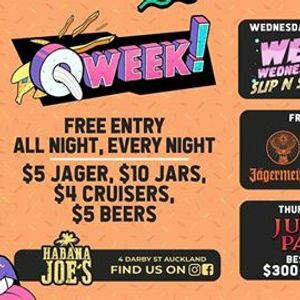 Habana Joes providing the BIGGEST and LOOSEST O'WEEK ever seen. Our brand NEW student night every Wednesday! We will be bringing you some of the best deals in town and have now got our very own Slip N Slide. What could go wrong?!?!?! We are going to light the whole of the city up with Glowsticks for the night. Cruiser is supplying our limited edition T-Shirts so be sure to grab one of them when you come through. Jagermeister have kindly supplied us with a HUGE prize to win. What will it be though? The only way to find out is come down and get have a look. Could it be a car? A puppy? A flight to FIJI? A huge CASH prize? Teaming up with TheVillagePeople to bring you some of the most disgusting House and Tech. These boys run one of the biggest Sunday sessions through the city and we are delighted to have them every Saturday with us in Joes. 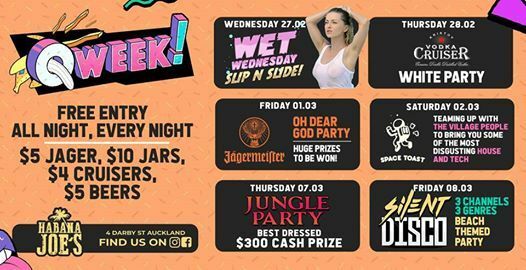 Get out your best costumes because KIWI have given us a massive $500 cash prize to hand away. So dress up as Mowgli, Tarzan, Jane or Kong. Even better and grab your Jumanji Crew and be in with a chance to win this HUGE PRIZE. This time with our Summer beach party themed Quiet Riot ? ? This Quiet Riot features the finest quality 3 channel silent disco headphones which give you the ability to switch between 3 genre channels. Each channel has a colour so you can see what channel is most popular. We will let you in on a little secret, if you didnt know we have a little sister called Hello Sunshine Rooftop Bar located directly above Joes. SpaceToast will be kicking off up there at 6PM. In association with Jager, Cruiser, Kiwi Experience and TheVillagePeople.